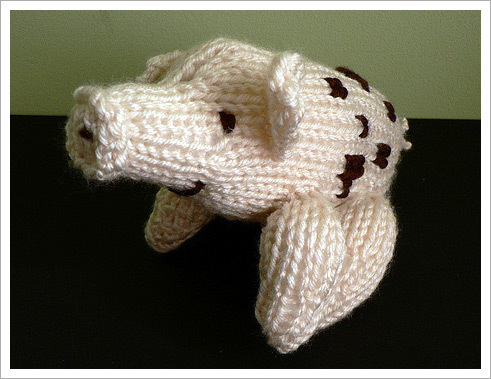 I've been knitting every Thursday at lunch with a few coworkers for nearly two months now. It's been really fun and interesting to see how the simple act of knitting in public attracts perfect strangers to stop and ask questions: "What are you guys working on?" "Is that knitting or crocheting?" "Is this a knitting club?" Hehe. Every week we get people asking us questions! So far a few people have shown interest and seem to want to join in on the fun. Today we did have someone who said she only knows one stitch and had been using Fun Fur. *shudders* Well, if she joins our group she'll have to leave that Fun Fur at her desk. 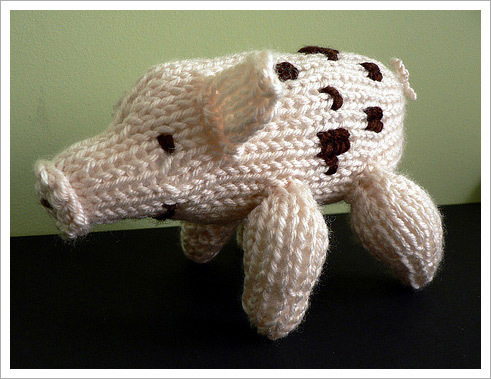 :P Oh yes, check out my little piglet for a piglet (my niece), from World of Knitted Toys by Kath Dolmeny! I'm so proud of myself for following a pattern. I've been knitting for a little over three years now and have only recently started reading patterns without going cross-eyed. I bought the book exactly a year ago, tried one pattern, and gave up. Reading stuff like ""k2 tog, k(20), inc one st into next 4 st" used to make my head spin, but now it's like "Oh pfft, I can do that." What a difference a year makes! I don't know what suddenly clicked inside my head, but now I'm not so scared of patterns anymore. Yeah yeah, it only took me three years to get here. I'm amazed at how quickly most people pick things up - My coworker Meggie was one of those "knit stitch/Fun Fur only" people until we started knitting at lunch. I showed her how to purl and combine her K and P to do ribbing, and suddenly she took off - so far she has done a ribbed scarf and now she's attempting a lace pattern! I still don't know if I'll ever do sweaters or anything complicated like that, but I'm pretty content just going at things in my own pace. 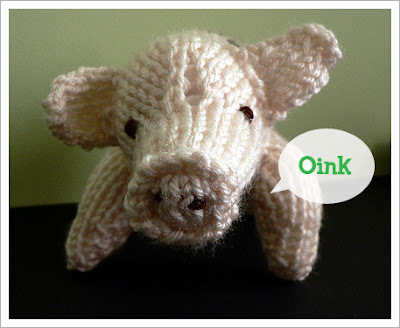 This little piglet is supposed to be for Baby N, but now I'm not sure if I want to give her away. Haha!